Live music this week by Hank's Theory. Cob Hill is a co-housing community in Hartland, VT that is the home of Cedar Mountain Farm. 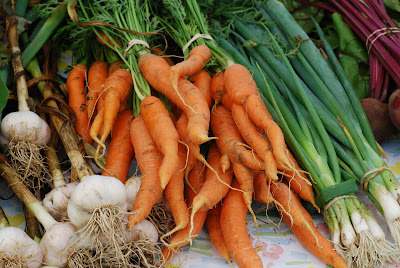 Kerry Gawalt and Stephen Leslie of Cedar Mountain Farm raise local meat and grow a wide variety of delicious vegetables without using pesticides. On the farm there are Fjord draft horses that help with plowing, moving stones, haying, and more. The horses are a great alternative to tractors and are a part of a more ecological way of farming that Cedar Mountain embraces. 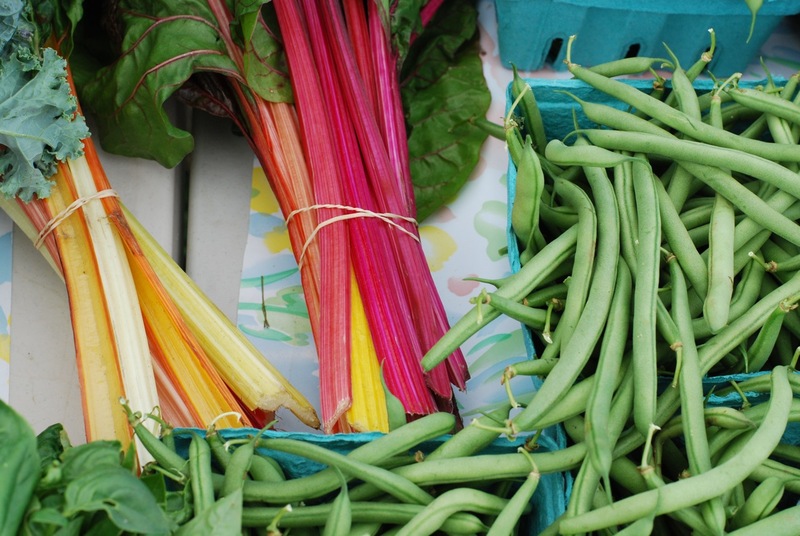 Just last week, the Cob Hill booth was offering rainbow chard, green beans, carrots, garlic, scallions, beets, kale, snap peas, herbs, and potatoes. If you're in the mood for a steak or hamburger, you'll find local meat at the Cob Hill booth, too. Try the beef sausages. Delicious! A special treat is the Cob Hill cheese for sale at their booth. The cheese is made from their Jersey cow milk, which is rich and quite delicious. I am a big fan of their alpine cheese, Mt. Ascutney. Want a taste? Stop by the booth and ask for a sample. 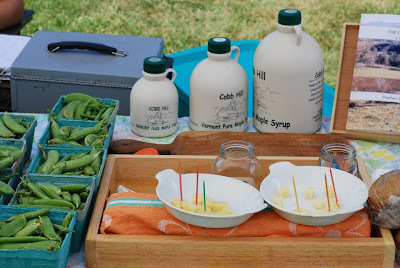 There are more treasures awaiting you at the Cob Hill booth including maple syrup, beautiful cards with photographs by Carla Kimball, A Little Farm Story by Jay Mead and homemade treats. 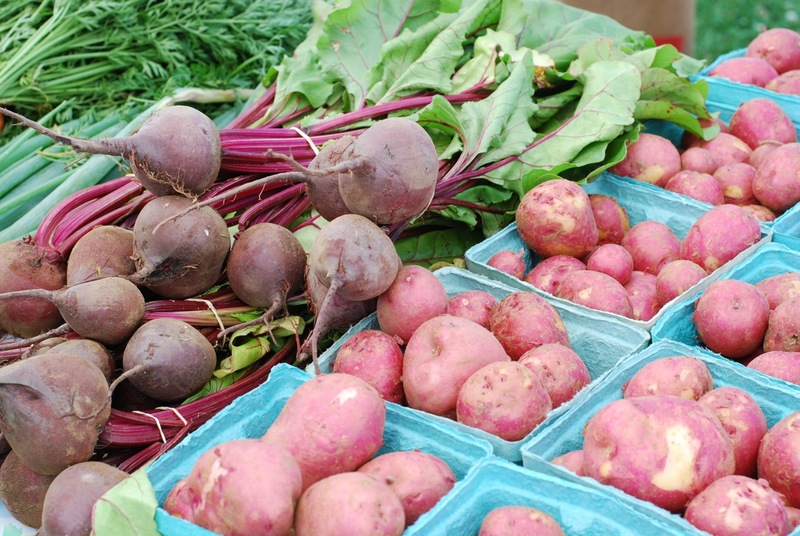 You can find the Cob Hill booth at the Hartland Farmer's Market every Friday. To learn more about joining the Cedar Mountain Farm CSA, just stop by the booth and ask to speak to Kerry. 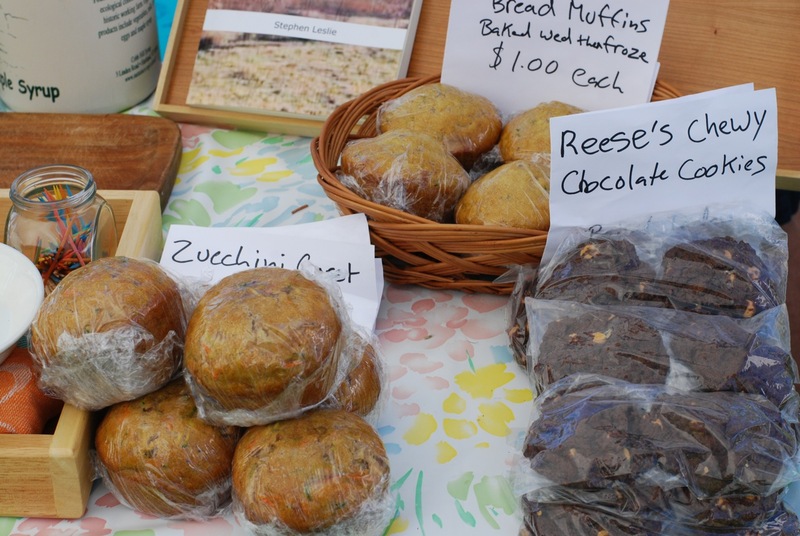 We're so lucky to have Cob Hill and their amazing local products at the Hartland Farmers' Market. Got a sweet tooth? 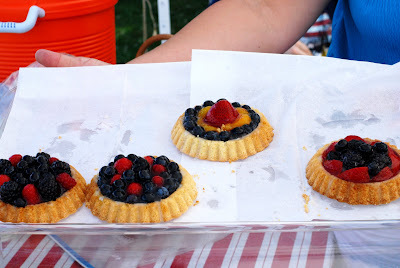 Head on over to the Rhine River Bakery booth on Friday at the Hartland Farmer's Market to get your fix. 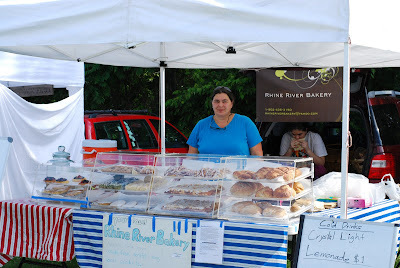 Angelika Stedman of Hartland, VT makes delicious German pastries and breads from scratch using many local ingredients. 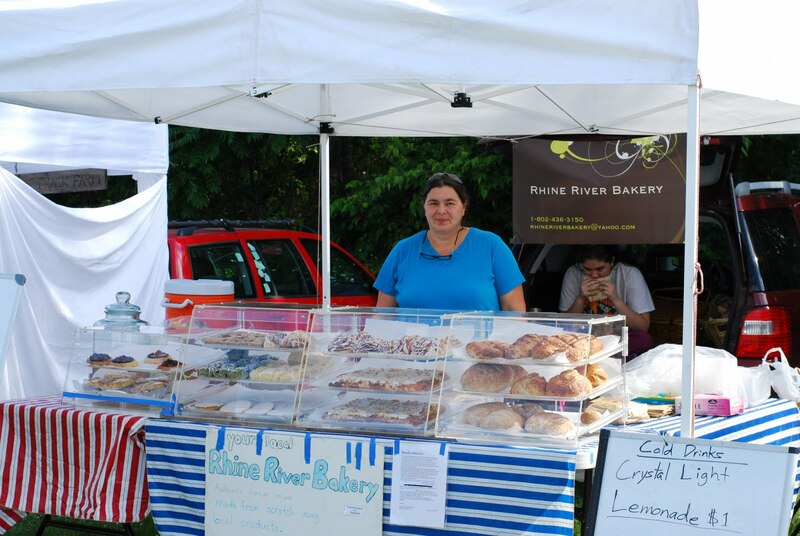 Angelika hails from Germany and named her bakery after the German river that she swam in as a small girl. Her loyal customers return each week for her little cinnamon rolls, drizzled with white icing. Her beautiful fruit tarts sell out quickly so come early if you have your heart set on one. She bakes streusel and homemade breads, too, including her famous bacon cheddar bread, which is sourdough based. 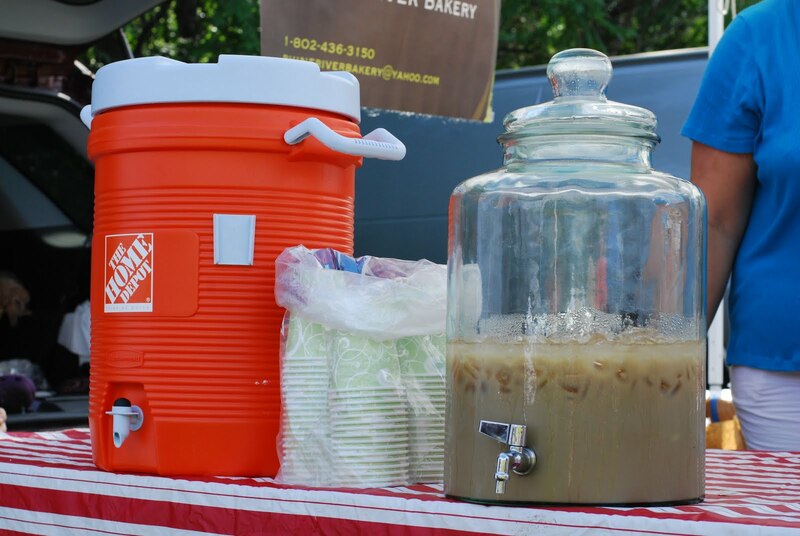 Iced coffee and lemonade are available at the Rhine River Bakery booth to quench your thirst on these hot summer days. Every once in awhile, you might just catch Angelika performing with the musical guests at the market (see below). Last week, she surprised everyone by joining Paul Brotchie in a wonderful rendition of the House of the Rising Sun! 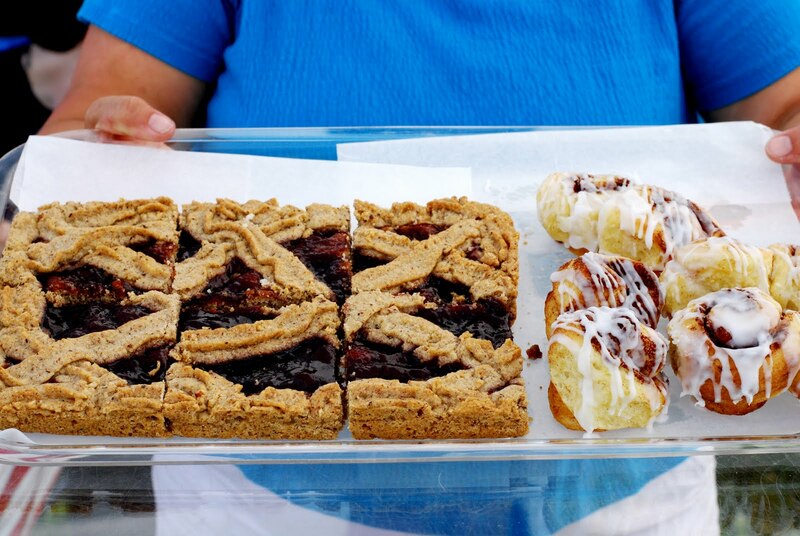 If you pay a visit to the Rhine River Bakery booth, you are guaranteed a delicious baked good served with a smile. Stop by and see what Angelika has baked from scratch this week and feel free to inquire about special orders, including gluten-free items. 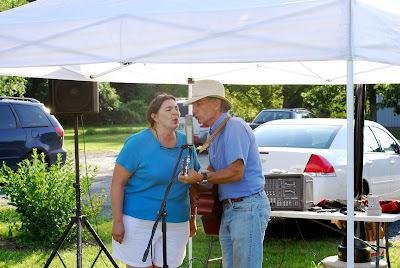 Music this week by Betsy Stewart. Know a community organization that you'd like to see at the Community Booth this summer? Let us know! Side Track Farm is a small farm in Hartland, VT owned by Silas and Chris Jacobson. Silas and Chris are dedicated to using local resources to manage their farm, including manure from their own animals and local seeds when possible. They raise chickens, turkeys and goats and these animals contribute to the natural cycles at the farm. The chickens and turkeys help keep insect populations in check while the goats keep the pastures open and provide manure for fertilizer. No pesticides or synthetic fertilizers are used at Side Track, and all of the produce is planted and harvested by hand. Each week you'll find a variety of vegetables and herbs at the Side Track farm booth. Don't miss their tomatillos and alliums (garlic, garlic scapes, onions, etc.) which they are known for. My husband is a big fan of their dried black turtle beans. He insists that they are the best he's ever eaten! I love their edamame--the perfect snack for adults and kids alike. Chris also makes charming flower bouquets, handmade paper, and pottery--all available at the Side Track Farm booth on Fridays at the Hartland Farmers' Market. To learn more about Side Track Farm, their CSA and farm stand, stop by their booth this Friday and say hello. Don't forget to reserve your Thanksgiving turkey now, too, as numbers are limited!